This week is #VolunteerWeek, where we take time to appreciate and thank all the volunteers that make a difference, whether with United Way or elsewhere in our communities. We wouldn’t be able to bring positive change to Simcoe Muskoka if it weren’t for our amazing volunteers. Unfortunately, volunteering in Canada is on the decline at a time when we need it more than ever. Perhaps you’ve thought about volunteering before or are thinking about doing some more. 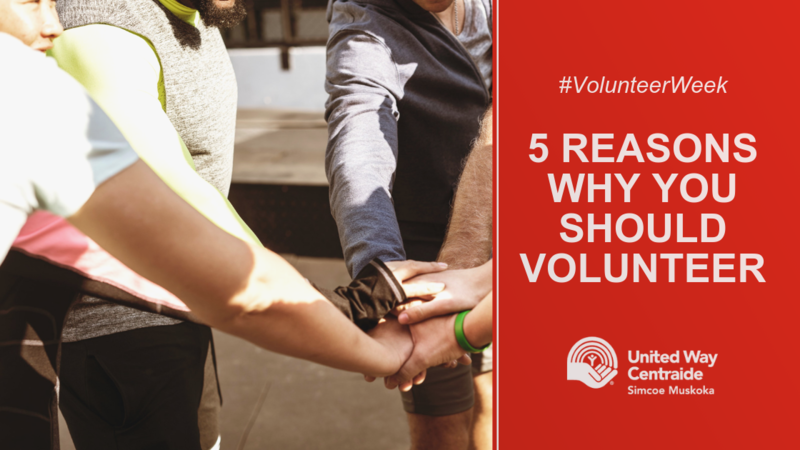 If you’re still on the fence about volunteering, let us help you make up your mind with these five ways that volunteering is good for you. We all know that actions speak louder than words. That’s why volunteering is a wonderful way to show your #LocalLove and make a difference in your community. When you volunteer, you are helping those that need help the most. Whether that be a community clean-up, driving someone to an appointment, preparing a meal or meeting any other need in Simcoe Muskoka, volunteering your time and skills changes lives and makes a positive impact. Because of the positive impact that you make, volunteering can have an incredible effect on your mental and physical health. Volunteers have shown reduced rates of depression and anxiety, among other mental health concerns. The positive emotions that you create by volunteering are long-lasting. Volunteering also reduces isolation by getting you out of your house and working with others. It gives you a break from stress at work or home by putting your mind to a task. Being a volunteer keeps you active, too. Rather than spending an afternoon watching TV, volunteering gets you on your feet and moving. 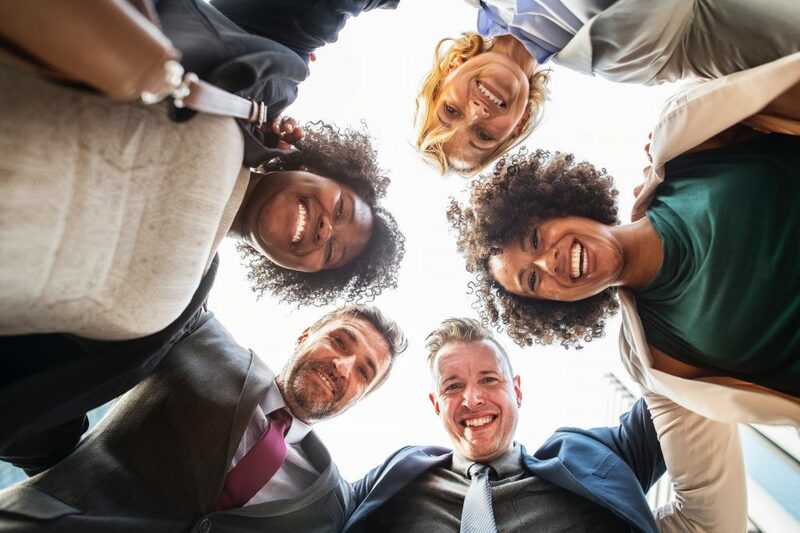 That’s not to say that all volunteer opportunities have you running around (unless you want that), but there are openings out there for people of all activity levels. Across the country, volunteer rates are lowest among those over 65. However, studies have shown that older volunteers have decreased mortality rates compared to non-volunteers. That means that there’s a correlation between volunteering and living longer. It’s a win-win! It’s easy for us to fall into a comfortable routine that can easily become stale and boring. By volunteering your time, you’re forcing yourself to experience something new. Even if you’re volunteering in a similar role as you have before, no two volunteer experiences are the same. Getting out of your comfort zone can be intimidating for the best of us. Luckily, volunteering pushes you out of that comfort zone while providing all the other benefits on this list. Leaving that comfortability can teach you new skills and introduce you to new friends and opportunities. Whether you are applying to school or for a new job, volunteering looks fantastic on your resume. Social responsibility is more important to both consumers and companies these days than it ever has been. Having volunteer experience could be the difference between the getting the job or giving it to someone else. Volunteering is a great way to pick up new skills, too. You bring your own strengths to a volunteer role, but you will always learn or experience something new. Take that new skill and apply it to future jobs! Don’t forget about the connections you make while volunteering, too. We’ve heard the adage, “It’s not what you know. It’s who you know.” Those people that you meet while volunteering might open up doors that weren’t there before. You aren’t just making a difference in your community when you volunteer; you’re having a ton of fun, too! You would have a hard time finding a volunteer who doesn’t love what they do. That’s because you give yourself a sense of purpose when you volunteer. Fulfilling that purpose isn’t just rewarding, but it’s a great time. Working with others, laughing with new friends and surrounding yourself with positive vibes all adds up to a lot of fun. So now you know the benefits of being a volunteer and you want to get involved? That’s awesome! But where do you start? There’s always more need for volunteers than there are volunteers themselves, so the opportunities can seem overwhelming. Here are some great places to start. Check out our Volunteer page for current volunteer opportunities with United Way Simcoe Muskoka. Identify your strengths that are uniquely you. A lot of volunteer opportunities are looking for very particular skills to help the organization. See what you can offer to fill those gaps and look for those opportunities. Get a group started. If you are a little unsure about volunteering on your own, get your partner, another friend or a whole team and volunteer together! It makes it a little less intimidating for everyone, and you all get to make a change together. Consider micro-volunteering. Micro-volunteering is a relatively new phenomenon, but it’s creating real change. If you can’t spare the time for regular volunteering, see if you can help with these little acts of kindness. #VolunteerWeek is here to celebrate the difference that volunteers make to organizations like United Way Simcoe Muskoka and the communities that we serve. If you already volunteer, thank you for making a difference here at home. If you haven’t volunteered yet, we can’t wait to see you out there. To keep up to date with volunteer opportunities and the impact that United Way Simcoe Muskoka is powering in our communities, subscribe to our newsletter and follow us on Twitter and Facebook.